Detailed industry report analyzing one of the most relevant and controversial issues of state shareholders in the gambling industry - updated and revised 2nd edition (2009). Four years ago we published our first privatisation study, which was very well received. In the past 12 months, as many new developments sparked increased interest in the market, more and more clients have asked for an updated study. Growing relevance of key drivers for privatisations – Ever increasing legal pressure (e.g., in most EU states), increasing liberalisation (e.g., in France), and/or tight state budgets (e.g., in the US) are putting pressure on state owners to evaluate a potential privatisation of their gambling assets. 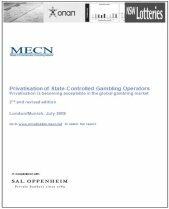 Drastic increase of likelihood that state gambling operations will be privatised soon – The number of experts surveyed who believe that some of the top state lotteries/operators will be privatised in the coming 2-3 years nearly doubled compared to MECN’s 2005 analysis and survey. Several privatisations are currently being considered – In addition to perennial “hot” privatisations, such as the UK Tote and Milli Piyango, many other ones are under discussion. According to our survey, several potential privatisations are expected to be at the top of the list: Some Australian and US lotteries/operators, the Hungarian State Lottery, and La Française des Jeux, to name just a few. Billions are on the table – Some of the lotteries/operators that are expected to be privatised in the near future are valued in the double-digit billion dollar range. Privatisation is no longer limited to only one method – In the future privatisation will not necessarily mean a change in ownership of shares, …. In addition, alternative forms, such as long-term licenses that transfer responsibility for operations to private companies, are also possible. Analysis of selected potential privatisations and overview of state operators most likely to be privatised in the near future. Case studies of already privatised lotteries/operators. Valuation of relevant state-controlled gambling operators. Discussion of advantages, disadvantages, and options for privatisation of state-owned gambling operations. Many results are based on a survey of more than 50 industry experts, including representatives from state lotteries, private online operators, and financial investors. In total, the second edition has nearly 100 pages and 36 graphs/exhibits. The report is co-authored by many renowned experts, among them the investment bank Sal. Oppenheim.